Rick Ferguson is a pianist, composer, and teacher in the Evanston music scene. An active chamber musician and avid recital partner, Rick Ferguson was selected to be a senior fellow for the Chicago Chamber Musicians and has performed chamber music, solo, and concerto repertoire in the US and Europe. He maintains an active life as teacher, composer, and arts advocate as co-founder and artistic director of The Musical Offering in Evanston, Illinois, and classical piano instructor at the Chicago Academy for the Arts. On the composition side, Concerto Grosso on Dystopian Themes for youth orchestra is a commissioned work through Foundation 65 in Evanston, Illinois, which was premiered in May 2018. Additional pieces in the works are Equity Suite for concert band and Prelude, Toccata and Fugue for piano and percussion ensemble. Mr. Ferguson is a strong advocate of STEAM-based education in our public schools. 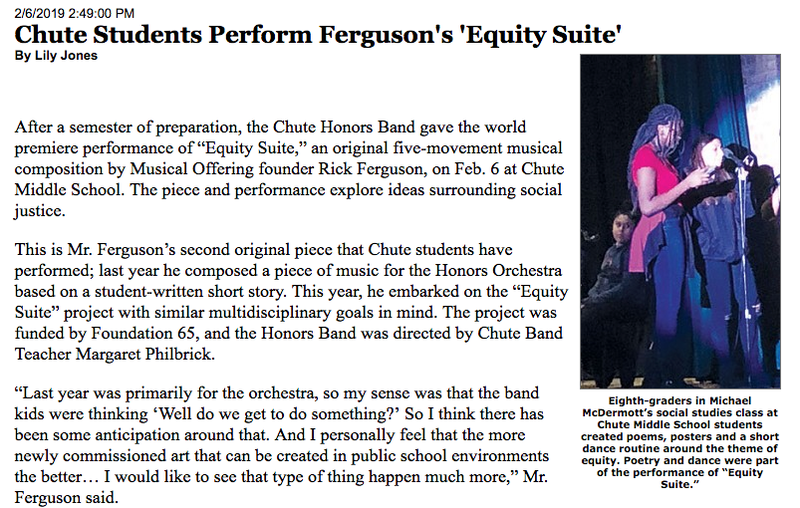 Click here to read about a spring concert I composed. As a Certified Teacher by The Royal Conservatory of Music in Toronto, Artistic Director of The Musical Offering in Evanston, Illinois, Classical Piano Instructor at The Chicago Academy for the Arts and as a chamber music and piano coach, I offer a wealth of experience and knowledge to students at all levels. Contact me to enquire!